Hit the beach with Layers by Scentsy! Our June Host Exclusive is a canvas tote made for long, sunny days — complete with Havana Cabana SPF 50 Lotion and Havana Cabana Lip Balm. 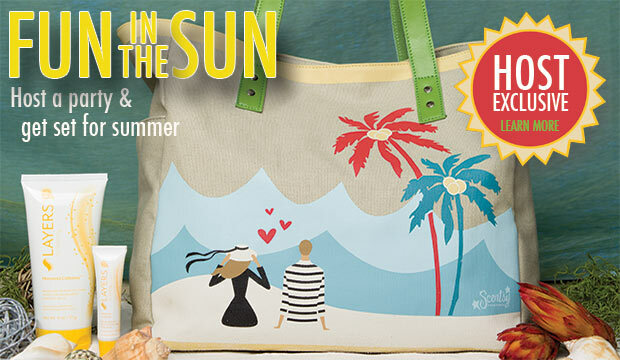 Get this Exclusive Bag for your summer trip to the beach or vacation this summer. It is perfect for fun in the sun! 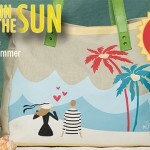 Each stylish bag is edged with sunny yellow and printed with a colorful original illustration, and two side pockets make stashing water bottles a cinch. Inside, you’ll find pockets to keep you organized — even a detachable clutch! Tote is approximately 13 inches tall, 18 inches wide at the top, and 14 inches wide at the base. The Host Exclusive is only $35 if used as one of your half-priced host credit. June Hosts can simply use the Host Rewards they earn — half-price, host credit, or overage — with a qualifying Scentsy Fragrance party of $150 (USD)/$200 (CAD) or more to buy their Host Exclusive. It’s that easy. Be the hostess with the mostess! The sun sets on this Host Exclusive on June 30. This Host Exclusive is available only while supplies last, so book your party today! Learn more about our Scentsy Sunscreen. I love my Scentsy Host and really enjoy our Scentsy parties. Learn more about hosting your own Scentsy Party Now!